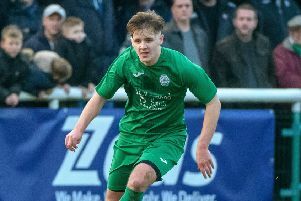 Biggleswade Town’s long unbeaten league run finally came to an end in Suffolk on Saturday - in their 12th fixture of the campaign. A strong Leiston side beat them 3-0 to leapfrog over the Waders in the play-off zone in the Southern League Premier Central table. Ironically this first defeat came in the week that Biggleswade Town were confirmed as the division’s team of the month for October, when they went through three matches without conceding a goal. The Waders won two of those three games, tough fixtures against St Ives and Coalville, while a 0-0 draw against Banbury continued a memorable unbeaten run that has stretched to November. It’s the first time the club has earned the award. It was the Waders’ first visit to Leiston. There was not much between the sides with the only difference being three goals taken well by Jake Reed, who scored midway through each half, and substitute Matt Blake late on. However the Waders did create plenty of openings and on another day could have returned with at least a point. ​Joe White, Jonny McNamara and Solomon Nwaboukei all had reasonable chances and on another day would have hit the back of the net. McNamara was excellent, twisting and turning to deceive the home defence while Nwaboukei improves his skill level every match . Generally it was a very creditable performance by the whole side. Up next is Hendon away in the FA Trophy Second Qualifying Round on Saturday. Hendon currently sit fifth in the Southern League Premier South - exactly the same as the Waders. There’s £4,000 in prize money for the winners as well as being a step closer to Wembley.